Newly elected president George Washington set out to visit the new nation aware that he was the singular unifying figure in America. The journey's finale was the Southern Tour, begun in March 1791. The long and arduous trek from the capital, Philadelphia, passed through seven states and the future Washington, D.C. But the focus was on Virginia, the Carolinas and Georgia. The president kept a rigorous schedule, enduring rugged roads and hazardous water crossings. His highly anticipated arrival in each destination was a community celebration with countless teas, parades, dinners and dances. 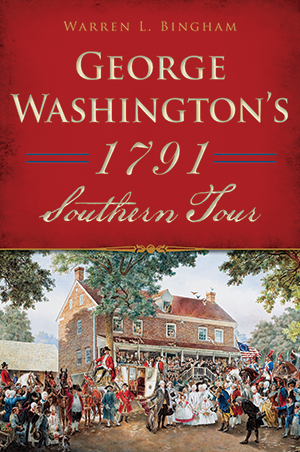 Author Warren Bingham reveals the history and lore of the most beloved American president and his survey of the newly formed southern United States. Warren L. Bingham is a writer, speaker and broadcaster with a deep interest in Southern history and lore. A graduate of the University of North Carolina at Chapel Hill and of Hollins University in Roanoke, Virginia, Bingham lives in North Carolina with his wife Laura and a couple of hounds.